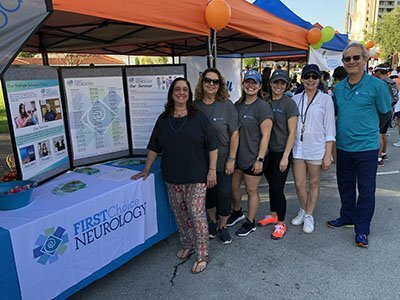 Dr. Victor Faradji, Dr. Karen Nater-Pineiro, Dr. Carlos Ramirez-Mejia, and Dr. Carlos Ramirez-Calderon, with First Choice Neurology staff Patricia Pena, Mayra Estevez, Elizabeth Brinegar, Frida Gonzalez, Nora Herrera, Nicole Simbaco, Thania Duran, Nathalia Orta, and Noah Ancheta. First Choice Neurology is always well represented at Walk MS, year after year. Walk MS brings together a community of passionate people for one powerful cause, to end Multiple Sclerosis forever. 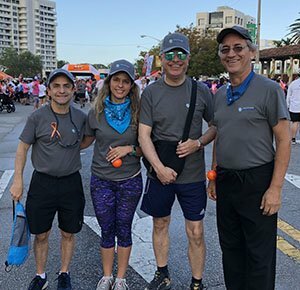 Last Saturday, Dr. Carlos Ramirez-Calderon along with staff members of First Choice Neurology participated in the Coral Gables Walk MS. It was a beautiful day to walk with friends, loved ones and co-workers to change the world for everyone affected by MS. Every step they took, every dollar they raised, helped with funding research and programs for Multiple Sclerosis. 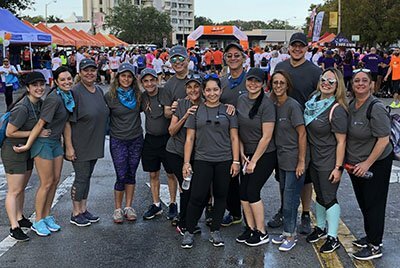 The Walk MS is also a place to connect with others affected by Multiple Sclerosis and to learn more about the services and support offered by the National MS Society. Walk MS has generated more than $1 billion toward Multiple Sclerosis research and programs. The National MS Society hosts events throughout the year to raise funds and create awareness about MS. Their mission is: People affected by MS can live their best lives as we stop MS in its tracks, restore what has been lost and end MS forever. Multiple Sclerosis research is a high priority for the National MS Society. They strategically invest in research worldwide to drive solutions for every single person with MS. Multiple Sclerosis (MS) is a potentially disabling disease of the central nervous system (CNS). The CNS is made up of the brain, spinal cord, and optic nerves. With multiple sclerosis, the immune system attacks the protective sheath (myelin) that covers nerve fibers and causes communication problems between your brain and the rest of your body. With time, the disease can potentially cause the nerves themselves to deteriorate or become permanently damaged. The damaged areas develop scar tissue which gives the disease its name – multiple areas of scarring or multiple sclerosis. The cause of MS is not known, but it is believed to involve genetic susceptibility, abnormalities in the immune system and environmental factors that combine to trigger the disease. Physical therapy and medications can be used to help with the symptoms of MS. Multiple Sclerosis affects more than 2.3 million people around the world. MS can occur at any age, but most commonly affects people between the ages of 15 and 60. It is most common in women, as they are twice as likely to like men to develop MS.
First Choice Neurology has 2 Comprehensive Multiple Sclerosis Centers located in Miami and Coral Gables. Our MS Centers operate in affiliation with the National Multiple Sclerosis Society. They give patients information, resources, and support available to live their lives with MS. Partners in Multiple Sclerosis Care are healthcare providers who have demonstrated knowledge and expertise in treating patients with MS. Our team is committed to the highest standards of excellence and offers a full spectrum of care to assist in the diagnosis and treatment of individuals affected by Multiple Sclerosis.